A former Terrier defenseman whose professional career was cut short by injury is moving up quickly on the management side of the game. 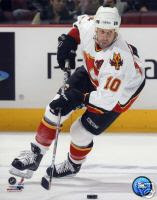 Jeff Kealty, whom the Quebec Nordiques made their first round draft choice in 1994 out of Catholic Memorial High School, played four years for Jack Parker, including the 1994-95 NCAA championship season. He blossomed on the BU blueline as a senior, then had a solid first pro season with Milwaukee (IHL; as a teammate of ex-Terrier Doug Friedman), but concussions forced his retirement during his second year. Kealty became a Nashville Predators scout in 2001 and last week was promoted to chief amateur scout. He works closely with another ex-BU player, Paul Fenton, the Preds’ assistant general manager who played nine NHL seasons—scoring exactly 100 goals—and whose son P.J. plays for Don Cahoon at UMass. “Experienced” fans will remember Nashville General Manager Dave Poile as a standout forward on Northeastern squads in the late 60s and early 70s and a member of the Huskies’ Hall of Fame. More details on Kealty are provided in a New England Hockey Journal article by Matt Kalman. Former Terrier captain Mark Mullen was named assistant coach for the USHL Cedar Rapids Roughriders. 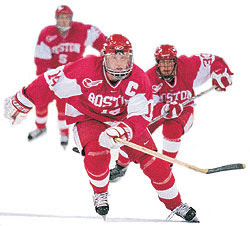 His best season at BU was 2002-2003 when he scored 27 points and was named Hockey East's Best Defensive Forward. Mullen played a season of ECHL hockey and coached high school in Andover, Mass., for two years since leaving BU. We previously reported that incoming freshman netminder Adam Kraus was in the Dallas Stars development camp. He’s mentioned in this Dallas News article while a Stars message board relates some ups and down for the Texas native who hopes to benefit from facing high-caliber shooters when he competes for the vacant goaltending job at BU this fall. This past Monday’s post included a video clip of Colin Wilson’s goal against Russia in the IIHF World U18 championship game. A sharp-eyed reader, searching You Tube for more NTDP U18 action, found a season highlight video compiled by Justin Vaive, which included another key play by Wilson, and now has forwarded the link. The goal was described in a THFBlog post back on September 24. With the score tied at 1-1and just six seconds left in a game against the Indiana Ice, the U18s drew a penalty. Indiana pulled its goalie for the offensive end faceoff, ready to storm the net. Wilson blew up the plan, winning the draw cleanly back to Kevin Shattenkirk who fired from his own goal line the length of the ice into the empty net for the game-winner as time expired. The sequence comes at 43 seconds into the video clip. Calgary Flames: Terrier Out, Terrier In? Former Terrier sniper and fan favorite Tony Amonte’s (right) two-year tenure as Calgary Flame appears to be ended. An unrestricted free agent, he’s not listed on the Calgary roster and with Mike Keenan taking the helm, a Amonte return seems unlikely. Keenan was the New York Rangers coach who sent Tony packing in 1994, just before the Rangers won their first Cup in 54 years. Amonte’s production dipped to 10-20-30 last season, bringing him to 900 career points in 16 NHL seasons. Might he follow Terrier linemate Shawn McEachern into retirement? Meanwhile, David VanderGulik’s strong first pro season has earned him a shot at the NHL. Following an injury shortened senior year at BU that ended with a broken wrist, VDG played all 80 regular season games for the Flames AHL affiliate, the Omaha Ak-Sar-Ben (Nebraska, backwards) Knight scoring 43 points and opening some eyes. Wow Did not know this kid until I seen him at this Camp. What do I know about him now? He has speed and has moves that will leave dmen behind looking for their well you get my point. The only problem is his size but in todays new NHL with his speed and his skill he can over come that. He has a great shot and does some scary things with the puck. Seeing him on a break away will be a treat. Another Flames fan suggests that "If there's an injury spot that opens, depending what Calgary's need is (PK especially) I wouldn't be surprised to see DVG [Nope, it’s VDG] get the call." If VanderGulik doesn't make the big club, he'll begin next season in a new city since the Flames have moved their AHL affiliate to Quad Cities (Illinois). That franchise move led to the demise of the UHL Quad City Mallards where ex-Terriers Matt Radoslovich and Jason Tapp have played the past two seasons. International Scouting Service's latest rankings for the 2008 NHL draft are posted on the hockeysfuture.com homepage. Incoming freshman center Colin Wilson (video IIHF World U18 Championship, vs. Russia) , son of former NHLer Carey Wilson, is ranked #6....When collegians like Brandon Yip participate in an NHL development camp (slide show, 5th slide), as Brandon recently did with the Avs, they not only pay their own travel expenses, to protect their NCAA eligiblity, but they also must pay pro-rated ice time fees...Incoming freshman Joe Pereira's younger brother, Mike, is making a name for himself. He's following in Joe's footsteps, transferring from high school in Connecticut to the South Kent School, which Joe led in scoring last season. Mike, who will be a junior at SKS, opened some eyes at two recent events, the Jr. Chowder Cup, where he led his team in scoring, and the ProAm Predraft tournament, where he joined Mike and a few recently graduated SKS players. One observer reports: "[Mike] isn't as fast as his brother but is still fast. But he can bury the puck, has great hands and is more skilled than his brother. " Updating an earlier post on the World Jewish Hockey Championships, BU sophomore forward Zack Cohen is bringing home a gold medal and a bunch of unforgettable experiences from his summer trip to Israel. Cohen scored 4 goals and 4 assists in games for Team USA in the tournament just completed in Metullah. The largely-collegian USA team, backstopped by former Harvard goalie Dov Grummet-Morris, beat Israel in the championship game, 2-1, after winning all three preliminary games. Canada took the bronze, beating France, 4-1. Cohen, who skated on a line with UMass forward Matt Burto and Middlebury’s Scott Bartlett, visited Jerusalem and Tel Aviv with his teammates and caught up with Grummet-Morris’ brother, an Israeli soldier. Metullah, where the Canada Center is located, is so close to the Lebanese border that Cohen could see a Hezbollah camp from the hotel swimming pool. The U.S. team included several sets of brothers and even a father-son combo. USHR reports that 50-year-old Caleb Koeppel, who once played for Trinity College, and Caleb’s son, Max, a club player at Syracuse University, made a unique a family affair. NHL.com also reported on the tournament as did the Israeli dailies. In a post last month (The Buddy System), we reported that recent Avalanche draft choices Kevin Shattenkirk and Colby Cohen (photo, right)had been teammates on the on the '89 East Coast Selects, a top summer/spring tournament program headed by Travis Howe, Gordie's grandson. A recent nhl.com feature looks at the impact of the ECS program, examines Howe’s philosophy, and discusses ECS’ first crop of alumni drafted by the NHL, including Shattenkirk, Cohen, BC recruit Nick Petricki and Edmonton draft pick Sam Gagner. Howe’s ECS Web site currently features photo essays on the development of Shattenkirk and Cohen. Future Terriers Corey Trivino (2008; and OPJHL/North Rookie of the Year) and Ethan Werek (2009), who will be teammates next season on the OPJHL Stouffville Spirit, also have participated in ECS programs. Incoming freshman goalie Adam Kraus, an Irving, Texas, native, has been invited to participate in the Dallas Stars’ rookies/prospects camp beginning next Monday. Kraus , who also had offers from three WCHA school, played for the NAHL Alaska Avalanche last season and previously with the Los Angeles Jr. Kings. SI.com’s “Best Game I’ve Ever Seen” series produced this gem today. It’s from Sports Illustrated reporter—and daughter of a Michigan State goalie, Lisa Altobelli describing her first Beanpot game while a student at BU. 2000-01 Terrier Captain Carl Corazzini is back in red, having signed a free-agent contract with the Detroit Red Wings. The Framingham speedster, one of many St. Sebastian’s alums to skate for BU, spent the past two seasons in the BlackHawks organization, playing 7 NHL games. He played a dozen games for the Bruins in 2003-04; earlier in his pro career Carl suited up for a team with one of the all-time best names: the Atlantic City Boardwalk Bullies. BU College of Communication professor Jack Falla, a former Sports Illustrated staffer, penned an insightful and revealing article about Captain Carl in a 2000 issue of Bostonia. BU 2008 recruit defenseman David Warsofsky has been named to the Team USA U18 team that will play next month in Slovakia and the Czech Republic. The team was chosen from players in the recently concluded national Select 17 festival in St. Cloud. Warsofsky, who played on last summer’s U17 USA squad in the Three Nation’s tournament, joins the NTDP program this fall and will play for Coach John Hynes’ Ann Arbor-based Under 18 team. In today’s Research on Ice newsletter, Paul Shaheen quotes Steel GM Jason Koehler as saying, "Nicastro will simply be one of the best first year Ds in the USHL this season. He is a stud in my opinion. Will be a top three round NHL pick - would not shock me that he becomes a first-round pick next summer if he adds weight to his frame. Max is not your typical West Coast player, more gritty. Very exciting, great PP guy." 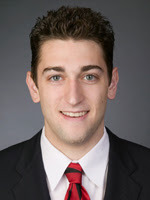 Saponari, whose brother Victor is in BU’s 2007 recruit class, was a top scorer with the NTDP U17s last season and moved up the U18s for the IIHF World U18 Championships. Warsofsky-Saponari should be a dynamic combo for next season’s U18s; Terrier fans will get a look on Dec. 8 when John Hynes brings his team to Agganis for an exhibition game. If the BU coaches observing the Select 17s scouted Omaha defenseman Adam Comrie, they probably were impressed. The defensively-minded LD from Virginia earned kudos from USHR’s Chris Warner: “Big – he’s 6’4” – and mobile. An excellent skater with a hard shot. Keeps the game simple. A little error prone, but he does have all the tools.” The Western Blog was even more effusive: “He probably has the most upside of anyone at the camp. He’s a big kid that is very physical and is good at jumping into the play. He’s a pretty good skater too. He had a lot of penalties, but more from being overly aggressive as opposed to being out of position.” It’s just speculation on our part, but with so many RDs expected on next season’s roster, Comrie might be a good fit for the 2008 class. It may be offseason, but most of the Terrier hockey team can be found on the ice together on Tuesday nights, keeping their skating and timing sharp by playing 50-minute non-checking games in the Hub City Pro Hockey Summer League at the Bridgewater Ice Arena. The current and incoming BU players are joined by recent grads such as Sean Sullivan, Tom Morrow, Kevin Schaeffer, Ken Roche and Ryan Weston. Brian Strait, Jason Lawrence and possibly one or two other Terriers are skating on Tuesday nights at the Bridgewater Ice Arena in the Hub City Summer Pro League featuring college and professional players. But the Terrier with the most unusual summer skating experience has to be sophomore Zach Cohen (pictured) . Last summer Northern Israel was filled with military units headed to the Lebanese borders to fight Hezbollah. This summer, just south of that border, at the Canada Centre rink in Metulla, the combatants are four hockey teams—U.S.A., Canada, France, and the host— competing in the first World Jewish Hockey Championship, July 13-20. Team U.S. headed by General Manager Neil Smith (W. Michigan alum) and Coach John Anderson (Chicago Wolves) has 13 current or former NCAA players on its roster including Terrier winger Cohen. Bobby Weston played for the Terriers in 1997-98 and 1998-99 before finishing his career at Babson. The goalies are Harvard alum Dov Grummet-Morris and former Michigan Wolverine Noah Ruden. Also on the roster are UMass forward Matt Burto and Miami’s Nathan Davis, one of two collegians to play for team USA in this past spring’s IIHF World Championships. Canada’s squad features Merrimack goalie Andrew Brathwaite and ex-Vermont Catamount Oriel McHugh. Israel’s squad includes Oren Eizenman, who scored the final RPI goal in last season’s 4-4 tie with the Engineers, and his brothers, Alon and Erz, and is coached by former Montreal head coach Jean Perron. We’ll post later this week an expected NHL.com feature about the tournament, which was originally scheduled for last summer, but postponed due to the hostilities. For those interested in the full rosters, see the comment below. Eric McErlain of the Off Wing Opinions blog conducted interviews this week at the Washington Caps rookie camp and, at our request, got upclose and personal with 2008 Terrier recruit Andrew Glass. Andrew, selected by the Caps in the seventh round, confirmed that he'll return to Noble & Greenough school for his senior, rather than join the USHL Ohio Jr. Blue Jackets who put him on their affiliate list. He indicated that BU told him to make the choice, but hinted that he might go to the USHL at some point, in which case his matriculation would begin in 2009. 2009 recruit Ethan Werek of the Stouffville Spirit has recently received strong recognition of his ample talent. Werek, a six-foot center who scored 128 points in 55 games for the Toronto Marlies minor midgets last year, recently was projected by International Scouting Services as the #5 pick in the 2009 NHL draft. Now, he has made the 35-man short list for for the Ontario U17 team which will compete in the World Hockey Challenge in December. Werek, who was one of five York region players selected for the short list out of 84 candidates, will be a teammate next season of 2008 BU recruit Corey Trivino on the Spirit, an OPJHL Junior A team co-owned by Ethan's father. BOSTON -- The Boston University men’s ice hockey program will welcome seven newcomers to its 2007-08 roster, as announced today by head coach Jack Parker. Nick Bonino (Farmington, Conn.), Joe Pereira (West Haven, Conn.), Victor Saponari (Powder Mills, Ga.) and Colin Wilson (Greenwich, Conn.) will bolster the team’s forward lines, while Kevin Shattenkirk (New Rochelle, N.Y.) and Colby Cohen (Radnor, Pa.) will join the Terriers’ defensive corps. Goaltender Adam Kraus (Irving, Texas) rounds out the freshman group. The Terriers had the most incoming freshmen selected in last month’s National Hockey League Entry Draft of any Hockey East school, as Shattenkirk and Cohen were picked by the Colorado Avalanche in the first and second rounds, respectively, and Bonino was a seventh-round selection by the San Jose Sharks. "This incoming class certainly filled our needs," said Parker. "We struggled a bit offensively last year after leading the league in scoring the year before. Freshmen usually don’t play a big role coming in, but this group will be counted on to be important members of our offensive production, both in 5-on-5 situations and on the power play." Wilson (shown in photo), the son of former Dartmouth and NHL standout Cary Wilson, was dominant at the AAA Midget level in Canada before joining the U.S. National Team Developmental Program. After moving up from the U-17s to join the U-18s late in the 2005-06 season, he was a member of the gold-medal winning team at the 2006 World U-18 Championships. He was the second-leading scorer this past year for the U-18s, which won the silver medal at the World Championships, and was tied for the lead in scoring for the tournament. The 6-foot, 190-pound forward is projected as a top-10 pick in next year’s NHL Entry Draft. The United States Hockey Report Prep Forward of the Year, Bonino (6-1, 180) captained Avon Old Farms to the 2007 New England Division I prep championship, finishing third among all New England preps in scoring with 66 points, including 23 goals. After being the top scorer at Farmington High School during the 2004-05 campaign, he moved to Avon and led the team in scoring (26-30-56). Bonino also was the leading scorer and co-MVP of the 2006 Spring Hockey Night in Boston. "Wilson is a big, strong center iceman who plays well in all three zones," said Parker. "He is a proven point producer who will center one of our top lines. "The same holds true for Bonino. He’s a gifted offensive forward who will be plugged in on our top lines, as well as the power play." Last season’s top scorer at South Kent School, Pereira (5-10, 175) led the Cardinals to the New England prep playoff semifinals. He scored 25 goals in each of his two years at South Kent after earning all-state honors at West Haven High School. "Pereira is the best skater among the newcomers," said Parker. "He possesses good speed and intensity and he is a real good goal scorer. We expect him to jump right in and fill one of the slots our forward lines." Saponari joins the BU program from Culver Military, where he posted 20 goals and 22 assists in 39 games this past season as a post-grad. The 5-foot-10, 170-pound forward was named to the all-tournament team at this year’s Cushing tournament. "Much like Pereira, Saponari is a determined and intense type of player," said Parker. "He will be an asset on our forecheck and will also improve our overall team speed." 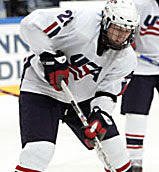 The captain of the U.S. National U-18 Team, Shattenkirk (5-11, 190) was named the top defenseman at the 2007 World Championships after helping his team earn the silver medal. He was named to the 2004-05 All New England Prep First Team as a sophomore at The Brunswick School before joining the NTDP. In the 2006 North American Hockey League playoffs, Shattenkirk led the U-17 team in scoring. "Shattenkirk is a complete player who is a real leader," said Parker. "He is a smart defensive player who can be an effective quarterback on the power play." 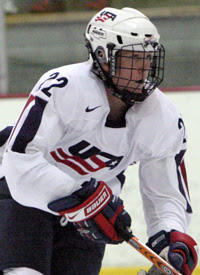 Cohen was also a member of the NTDP before moving on to play for the Lincoln Stars of the United States Hockey League. He led all USHL defensemen in scoring this past season with 60 points (13g, 47a). The 6-foot-2, 200-pound blueliner broke out on the scene in 2004-05 with the Syracuse Stars of the Eastern Junior Hockey League, tallying 43 points in 50 games. "Cohen is a terrific offensive defenseman," said Parker. "He has great hands and passes well, and he put up a lot of points during his year in the USHL. Like Shattenkirk, we expect him to be important for us on the point in power-play situations." Playing for the Alaska Avalanche of the North American Hockey League, Kraus (6-3, 175) posted a 3.50 goals against average and a .912 save percentage this past season after spending two years as a member of the Los Angeles Jr. Kings at the AAA Midget level. "Kraus was a highly recruited goaltender, especially by schools from the WCHA," said Parker. "We are confident that he can enter the goaltending mix right away and fight for ice time." The Washington Caps summer development camp begins today in Arlington, Virginia, and 2008 recruit Andrew Glass (see July 8 post) has been invited. Thanks to our friends at the Off Wing Opinions blog, we hope to have some video of Andrew in action later this week. Hockeysfuture.com’s recap of Capitals’ draft picks offered additional comments about Glass. Thanks to Brian Gentry for posting this information on USCHO. Andrew Glass was drafted out of Nobles High School in Massachusetts where he had 17 points in 18 games in the 2006-07 season. Slated to play for the Ohio Junior Blue Jackets of the USHL this fall, Glass will attend Boston University beginning in 2008. Called one of the top players his age in New England by his former coach Chris Masters of the Boston Junior Bruins, Glass is a good stick handler with the agility to beat defenders one on one. He can keep puck control in traffic which makes him a good penalty killer, but will need to use his body to his advantage to be a successful player at the higher levels. Both the Off Wing Opinion post and the hockeysfuture.com recap indicate Glass will switch from the Noble & Greenbough school to the Ohio Junior Blue Jackets in the more competitive USHL for his senior year. Chris Heisenberg’s recruiting Web site still lists him at N&G. We’ll look for a definitive answer and post it. Nick Bonino was the Sharks second selection of the sixth round and, like Zackrisson had been passed on in the previous draft. Bonino was nearly taken by San Jose last season with their final pick, but now has the opportunity to join their prospect ranks a year later. The Connecticut high-schooler had another strong year as a big center dominating the smaller competition with 23 goals and 43 assists in 26 games while attending Avon Old Farms, but there are concerns that he does not have the skating ability to compete at higher levels. He will attend Boston University in the fall, and the hope is that he will be forced to improve his speed enough to make him worthy of a professional contract. The Sharks are very high on him and were happy to be able to get him so late in the draft. Out in Arizona, 2006-07 captain Sean Sullivan and goalie Brett Bennett are working out at Coyotes’ rookie camp, where former/current rivals have become teammates. Coyotes’ TV offers an interview with Sullivan and BC forward Benn Ferriero that focuses on the Terrier-Eagle rivalry. Other familiar faces in camp include Keith Yandle, Daniel Winnick and David Spina. Future Terrier defensemen David Warsofsky (2008; Gold squad) and Max Nicastro (2009, Maroon squad) are in St. Cloud, Minnesota, for the National Select 17 Festival. So is 2008 recruiting target Vinny Saponari (Teal squad) whose brother Victor joins the Terriers this fall. One of the BU assistant coaches, most likely David Quinn, is at the festival to observe these prospects and other candidates for the 2008 recruit class which needs a second defenseman and another forward. Longtime Boston Globe reporter Marvin Pave includes 2008 recruit Andrew Glass in his column today on local athletes. Wrentham's Andrew Glass, who will be a senior at Noble and Greenough School in Dedham, is creative both on and off the ice. Glass, taken in the seventh round (199th overall) of the National Hockey League entry draft by the Washington Capitals, runs his own company, which he calls Noble and Greenlawn Landscaping. While taking a water break in his truck on June 23, Glass's cellphone rang. The person calling was a representative of the Washington organization, who said, "Welcome to the Washington Caps." Calls from Andrew's dad, Michael, and other friends who heard the good news soon followed. "That was a pretty cool moment," said Glass, whose close friend and Nobles linemate, senior Josh Franklin of Wrentham, will attend the University of Vermont this fall. "It's always been my dream to play professional hockey and it was nice to get drafted even after missing some games last season because of injuries." who started the family's cleaning supply and machinery business from scratch. He also appreciates the time his father spent as his youth coach and for getting him started as a hockey player. Glass, who plans to attend Washington's summer development camp this week at the Kettler Capitals Iceplex in Arlington, Va., is a 5-11, 180-pound winger. According to scouting reports, he has good puck skills, a quick stick, and the agility to beat defenders one-on-one. He is also an effective penalty killer. Glass has committed to Boston University for the fall of 2008 after considering Harvard, Boston College, and Providence College. "Aside from the academics, the BU coaching staff won me over. It's a great program and a great rink and BU has been a path for many players to the pros," said Glass, who had seven goals and 15 assists as a Nobles freshman, improved to 15 goals and 24 assists the next season, and had seven goals and 10 assists in a 2006-07 season shortened by a strained shoulder and twisted knee. "Andrew has continued to grow as a player," said Nobles coach Brian Day. "He's played a significant role in helping us make it to the semifinals of the New England Prep championships the last three seasons and winning the Independent School League title in 2005 and 2006. Andrew has made the commitment to being a better player." We’ll look for coverage of the Caps summer development camp, as well as some reliable message board assessments of his performance there. Besides playing for Nobles, Glass has played three seasons on the Little Bruins, the Boston Jr. Bruins organization fall team for mostly prep players. While his injuries limited him to just 12 games last fall, Glass tallied 7 goals and 8 assists. The previous season, his line was 9-11-20 in 19 games. Strait is a gem... he looked quite good again in game situations yesterday, but didn't get to throw the body a whole lot as I assume they were told not to do too much of that, but you can tell that he uses his body very very effectively and looks very strong when pinning guys against the boards... he was good with his stick as well and didn't get beat on anything. He even showed that offensive skill again, making some nifty passes and scoring a few very nice goals, but as I said before, he seems to play a safe game and at the NHL level, I see more of a defensive defender (unless he works on his offense some more & becomes willing to take a chance or two, which he would project as a two-way defender). We've not yet seen any evaluations of Eric Gryba's performance at Senators' camp, but an Ottawa fan has posted video (and more video) showing Gryba (#61 in black) in action. His team won the Sens' 3-on-3 competition. You're going to love having Chris Drury in Ranger Blue. This man is the epitome of an unselfish hockey player. He's battle-tested, grizzled, and has a flair for the dramatic.He's a hockey player that can't do anything to a team besides make it better, regardless of what you pay him (though you're paying him an awful lot). He scores big goals at clutch moments as you witnessed first-hand, and he's a great penalty killer. His offensive numbers are present, as is his two-way game. Any way you look at it, the signing is a great one for the Rangers.He'll blend in in NY, where he won't have to worry about taking the spotlight with guys like Jags and Gomer there, which is the way Dru likes it. Three former BU standouts were among the big winners on the first day of the NHL’s free agency. Former BU defenseman Ryan Whitney re-upped with the Penguins for six seasons on a $24-million backloaded contract had the sixth highest point total among NHL defensemen in 2006-07. The 6-4 blueliner had just completed his second full season in Pittsburgh, which is emerging as an elite NHL team. The next stop for Chris Drury’s ballyhooed career just had to be…. Broadway. The former Terrier All-American, 1995 NCAA championship team member, Hobey Baker Award winner, and co-captain of last year’s top-scoring NHL team, the Buffalo Sabres, now moves to the other end of New York State, signing on with the Rangers for five years at $35.25 million. The Broadway Blueshirts also added Devils star center Scott Gomez who joins Jaromir Jagr and Brendan Shanahan on an offensively-gifted Rangers’ team. Next decision: which free agent gets number 23. While Drury moves into New York, his Terrier teammate and fellow All-American at BU, Tom Poti, is leaving the Big Apple for Washington, D.C. After playing with the Rangers and Islanders the past four seasons, the former Olympian from Worcester, Mass., signed a four year, $14-million contract with the Caps. Last year Poti rebounded from a subpar 05-06 season to be the Islanders' top defenseman. Today’s news is from the Pittsburgh Penguins’ organization, Earlier this week, rumors emerged that BU’s All-American (East) goalie John Curry had signed a pro contract with Pittsburgh. Pens’ fan site Faceoff Factor now has confirmed that the Shorewood, Minnesota, product has been inked to a two-year deal. The Penguins hold the draft rights to Notre Dame’s David Brown, the All-American West goalie, and St. Cloud netminder Goepfert, but according to pittsburghlive.com , the team will not pursue a contract with Goepfert, who began his college career at Providence and once considered transferring to BU. Like Curry, Brown and Goepfert have concluded their college eligibility. Former Terrier Ryan Whitney has blossomed as a Penguin, who teamed him last season with ex-BC Eagle Brooks Orpik. Rob Scuderi also is a member of the blueline contingent and ex-Harvard d-man Ryan Lannon will be looking for chance to make the big club this season. The Pens’ summer conditioning camp for rookies and prospects brought together as teammates Commonwealth Avenue rivals Brian Strait and BC’s Carl Sneep. NHL.com described some of the “team building” off-ice activities, quoting Strait, while a video clip provides further illustrations. The value to college-eligible prospects of attending the camp at their own expense is examined by the Post-Gazette. Another Terrier currently in an NHL development camp is Eric Gryba, who is in Ottawa at the Senators' camp. Several ex-Terriers become free agents today, including Chris Drury, Tony Amonte, Joe DiPenta, Tom Poti, Dan Lacouture, and Carl Corazzini. We have more post-draft coverage beginning with a feature on Colorado’s #1 choice, Kevin Shattenkirk. 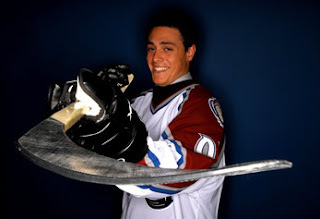 He and second round choice Colby Cohen are not the first Terriers connected to the Avs organization. Drury, who played a key role on the Avs 2001 Stanley Cup championship team, was a 3rd round draft choice when the franchise was in Quebec. Jeff Kealty was the Nordiques final first round draft choice before the team moved to Colorado. 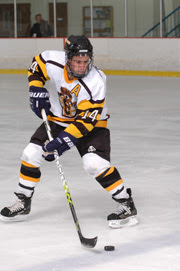 The New Brittain Herald interviewed San Jose Sharks' sixth round choice and incoming BU freshman Nick Bonino, who led Avon Old Farms to the New England Prep championship in 2007. Both this article and another on the San Jose site indicate that Sharks scouting director Tim Burke had hoped to draft Bonino last season, but didn’t have room to make the choice. That was rectified in this year’s entry draft. Super Saponari Brothers: 2007 Terrier recruit Victor Saponari of Culver Military Academy and his brother Vinny, an NTDP U17/18 standout and a 2008 recruiting target, have been keeping busy in their home state, playing in the Georgia Elite High Level Camp. Vinny and Victor were the overall first and second leading scorers and their Honeyman team won the annual event. ISS Scouting has released preliminary top five selections for the next two drafts and 2009 BU recruit Ethan Werek was ranked #5 for that year. Incoming freshman Colin Wilson, who ISS had in its top five for 2008 last year, has dropped out of the top five, but remain a projected early first round choice. The National Select 16 tournament was played last week in Rochester, N.Y. BU 2009 recruit target and new NTDP U17 member Ryan Bourque was fifth in scoring, despite playing for a weak team in the event. New Jersey Junior Devils product Kyle Palmieri, another incoming NTDP U17 who played in the Select event and has expressed interest in BU, is the nephew of former New York Mets shortstop and manager Bud Harrelson. Another new U17 player, defenseman Richie Crowley of Thayer, had a strong tournament with three goals in five games.